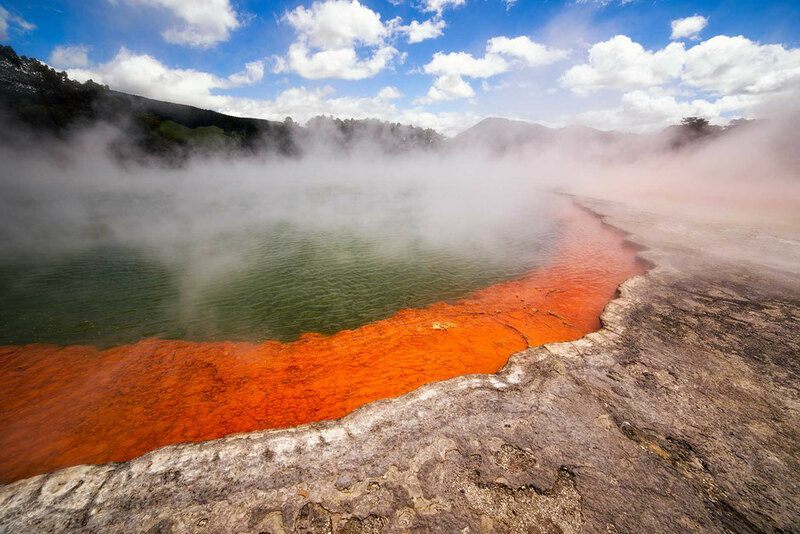 The Taupo Volcanic Zone has one of the highest geothermal activity ratings in the world. 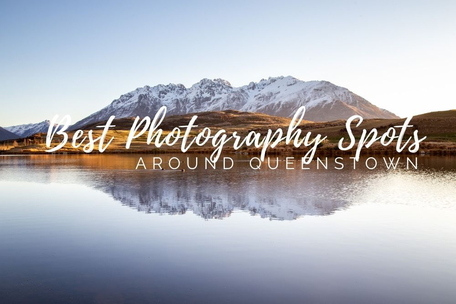 It lies in the beating heart of New Zealand’s North Island and stretches from Mount Ruapehu into to the Pacific Ocean past White Island. Wai O Tapu’s, whimsically named, Thermal Wonderland is a series of brightly coloured geothermal pools, stinky sulphur mud baths and explosive geysers, directly in the middle of this volcanic zone. How do I get to Wai-O-Tapu? The closest city is Rotorua, 30 minutes (30km) drive away. Taupo is around 55km away from the park's entry and takes around an hour. It’s really easy to find. 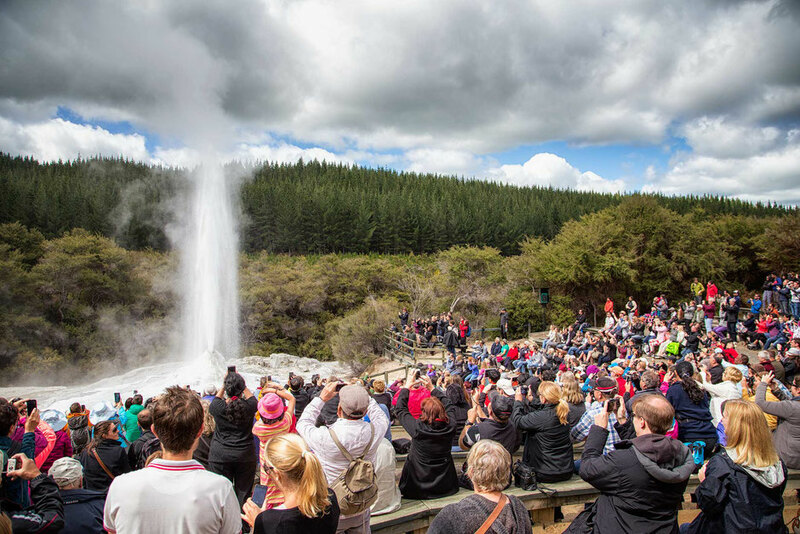 Tours depart from both Taupo and Rotorua and a shuttle bus can be booked if you don’t have your own transport. If you plan on self driving make sure to leave early. The parking lot near the attraction does fill up quite quickly. The eruptions in Wai-O-Tapu aren't like those for example in Hawaii, where molten lava flows into the ocean. 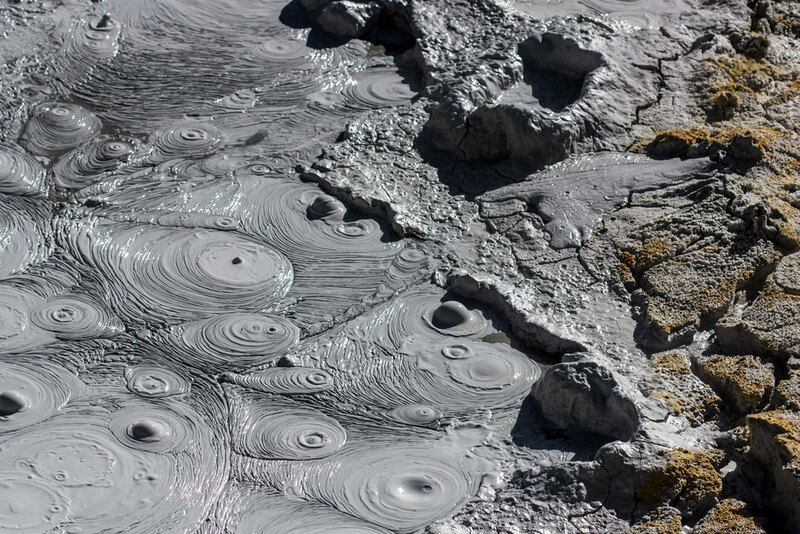 They are mainly observed as gaseous expulsions from vents, cauldrons and colourful geothermal pools. The distinct sulphur smell, similar to that of rotting eggs will accompany you throughout your visit to this fascinating natural wonder. 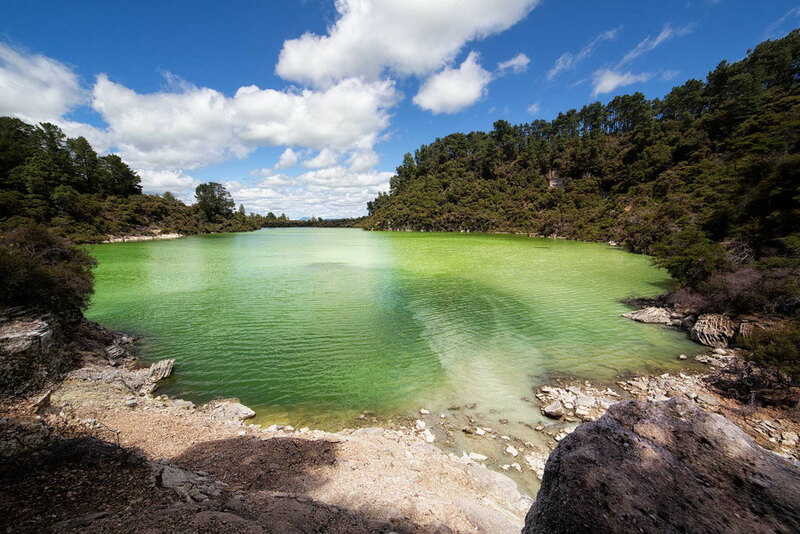 One of the most iconic photo spots from New Zealand’s North Island, the Champagne Pool gets its name from the abundance of carbon dioxide much like a glass of bubbling champagne. The vivid dali-esque champagne pool is caused from the high sulphur content combining with the ferrous salts in the water. Like a melted emerald bath tub, this deep crater was created from an eruption deep underground. Turns out Lucifer doesn’t like bubbles, rubber ducks and sponges but rather bathing in stinky sulphur in a bottomless pit. 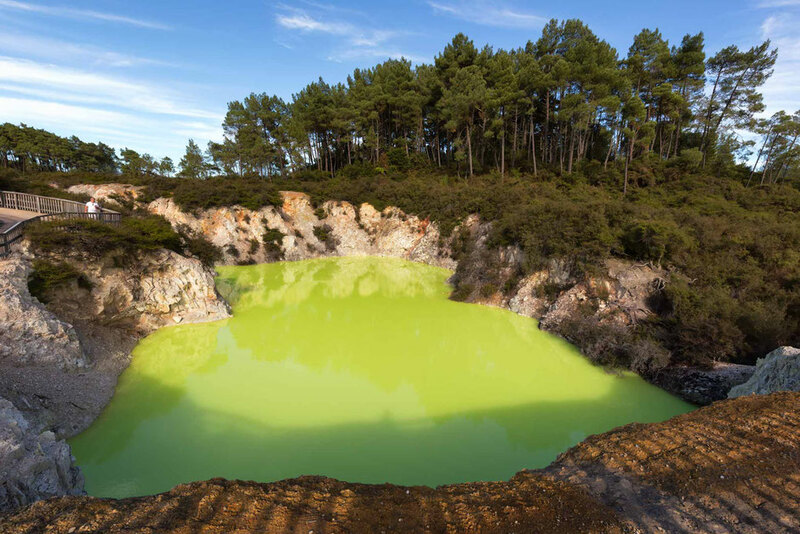 The iridescent lime colour comes from the sulphur floating on the surface. I’ve never seen anything like it before. 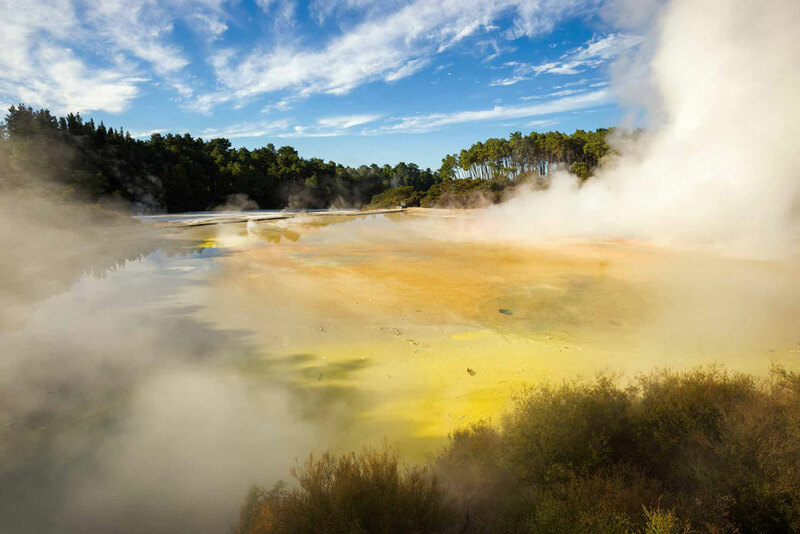 Wai-O-Tapu has several active geysers, the most famous of which being the Lady Knox geyser. It can spurt over 20m high and easily erupt for over an hour. Unlike the geysers I’ve seen on the Bolivian Altiplano which discharge continuously, the Lady Knox geyser is forced to erupt everyday by a park ranger and a bag of soap. If this wasn’t done, the geyser would naturally erupt every 24 to 48 hours at sporadic time intervals. The show starts at 10:15 daily but if you want front row seats plan on getting there at least 30 minutes beforehand. My favourite, Lake Ngakoro, turns from a dull olive green into iridescent acid green when the sunlight breaks through the clouds. It’s the furthest view point away from the visitor centre but certainly worth your effort. The nearby waterfall is also stunning. Don't let the name 'pool' not fool you. You won't be able to swim in it. Located a short 5-minute drive away from the Wai-O-Tapu's entrance, the bubbling, coughing, spitting mud pools are fun to watch. Randomly spurting out all over a deep hot swamp. The area is well signposted and impossible to miss. 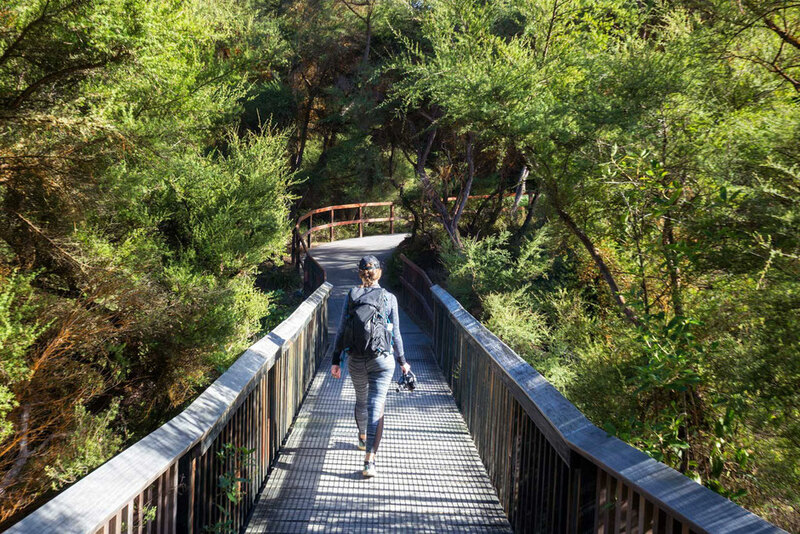 The walkway around Wai-O-Tapu is mostly along a well-maintained boardwalk (just like on the photo above). There are 3 intertwined routes which are 1.5km, 2km and 3km and take 30 minutes, 40 minutes and 75 minutes respectively. Upon purchasing your admission, you will receive a map. Everything is really well sign posted. Just follow the numbers. The path is adorned with informative signs at most craters and pools. Are drones allowed in Wai-O-Tapu? A question that is commonly asked in the emails you write to me. Similarly to many other places in New Zealand, drones are not allowed in Wai-O-Tapu unless previous arrangements have been made. Fines for flying drones in prohibited zones in New Zealand are pretty hefty so make sure you obey the rules. It's worth noting that Wai-O-Tapu has been voted “One of the 20 Most Surreal Places in the World” by TripAdvisor. 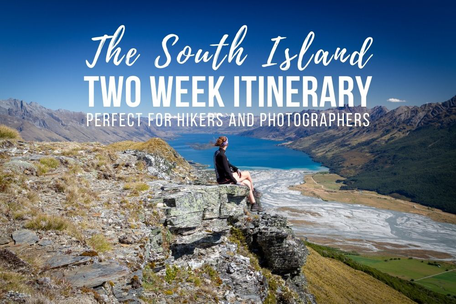 This experience features on all of my New Zealand North Island Itineraries. If you’re coming over to this part of the world, the itineraries will help you plan your epic road trip. If you found this useful, you can book your Wai-O-Tapu Thermal Wonderland tickets here. 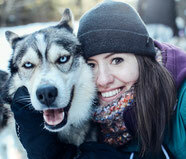 Booking through Viator won’t cost you anything extra but for every booking you make, I get paid a small commission. It helps me keep on creating useful guides like this one. 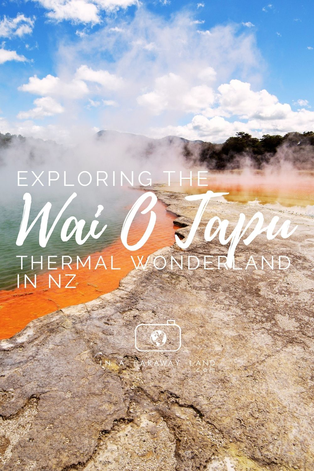 Have you got any questions about visiting Wai-O-Tapu or travelling around New Zealand? Post them in the comments! I will be happy to answer!